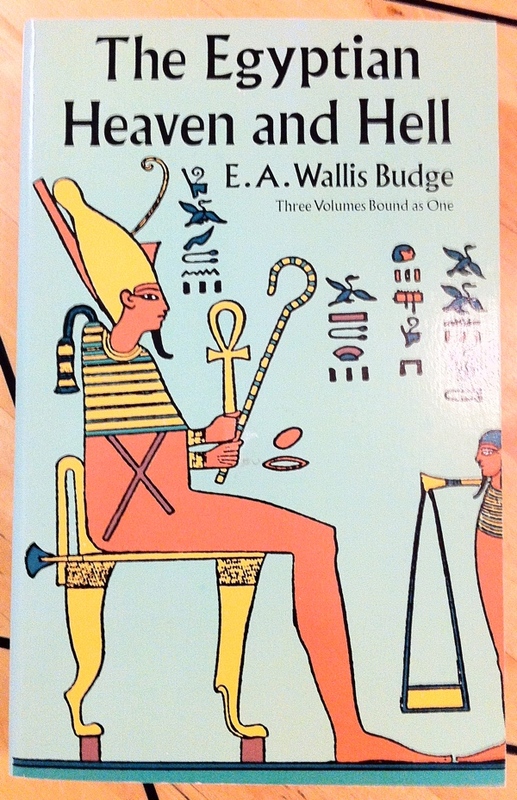 The Egyptian Heaven and Hell by E A Wallis Budge, three volumes bound as one, from Dover, is part of the collection at the Reading Room. “Like the Book of the Dead, the ancient Egyptian document that contained specific instructions and guides for the behavior of the disembodied spirit in the Land of the Gods, the present work is crucial for understanding hieroglyphic Egyptian beliefs about death and the afterlife. It comprises complete hieroglyphic renderings of the texts of two ‘books of the underworld’—the Book Ȧm-Ṭuat and the Book of Gates—which provided the dead with a guide their souls would need to make the journey from this world to the abode of the blessed. In these books both the living and the dead could learn not only the names, but also the forms, of every god, spirit, soul, specter, demon and monster they were likely to meet along the way. For modern readers, these ancient texts throw considerable light on the development of material and spiritual elements in Egyptian religion and on numerous primitive gods unknown outside these books. This entry was posted in Hermetic Library Reading Room and tagged Ancient Egypt, ancient egyptian religion, Book of Am-Tuat, Book of Gates, books, Dover, E A Wallis Budge, Egypt, Egyptian hieroglyphs, Egyptology, Reading Room on May 30, 2014 by John Griogair Bell.